So you think the royal wedding has been overexposed? Don’t be silly. The overexposure has only barely begun! And today, the cats and I do our part to keep the royal media extravaganza going, with a tsotchke assist from my sister. 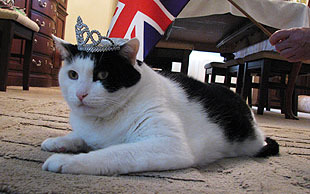 On the left, Inkblot is celebrating the great day — and demonstrating his serene confidence in his own masculinity — by wearing a lovely royal tiara. Majestic looking, isn’t he? And aside from being made out of plastic, it’s just like Kate’s! Except for all the parts that aren’t. On the right, Domino is royalty percatified, surrounded by my sister’s treasures. Unlike Inkblot, who’s generally willing to plonk down wherever you put him (for a while, anyway), Domino doesn’t really like being told what to do. This meant that her picture took a little while longer to set up. Basically, I had to wait for her to go to sleep somewhere and then start piling stuff up around her. That only worked for a few minutes, but a few minutes was all I needed. So anyway, happy royal wedding day! 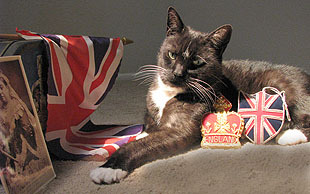 It’s a bank holiday in Britain, and I declare the rest of the day a cat holiday in America. Go pet a cat!